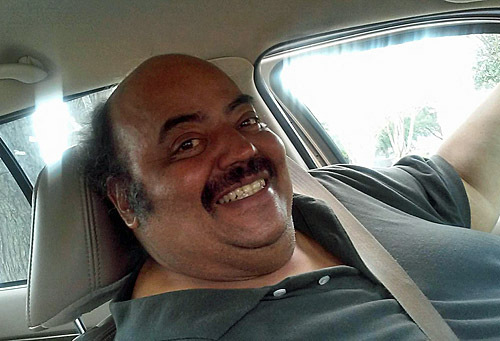 On April 2nd, Selby Anderson of San Antonio, Texas informed the chess community that Alfred “Big Al” Carlin passed away at Presbyterian Hospital on April 1st (Easter Sunday). He had been suffering from the effects of congestive heart failure. Herminio Baez stated that the five-time Louisiana state champion had worked for him as a coach since 2005. Baez visited him in the intensive care in his last days. Today would have been his 66th birthday. Carlin ended up in Dallas in 2005 after Hurricane Katrina swept through the Gulf and wreaked havoc on New Orleans, also known as “The Big Easy.” He resided in the 9th ward which was devastated by water surges of up to 15-20 feet. I had called to check on Rene Phillips and Carlin. Phillips was stuck in a hotel with his family in Sulphur, Louisiana. When I tracked down Carlin, he told me a harrowing story. The hurricane woke him up at 3:00am. With the strong winds bearing down on him and water rising, he fled just ahead of the devastation. He mentioned as he was fleeing the water was waist-deep in some areas. He was able to find refuge in Dallas, Texas at the home of his brother, Blanchard Carlin. I know I,m a little late (LOL) sending this reply. I want you to know I,m still in Dallas teaching chess. I,m working hard and enjoying teaching all the fantastic little kids here. Still trying to get where I want to be but far better than right after Katrina! One of the main things I think you for is helping me connect with Herminio Baez! He has proven to be one of the best friends I have here in Dallas. I think of him as more than just a person I work for. He has been there for me many times when I needed help. Also he,s a great chess instructor and all around great guy. Thank you for mentioning him to me and also for you being he guy you are! Keep up the good work Daaim! Born in New Orleans on April 3, 1952, Carlin was a mainstay in Louisiana chess winning the state championship five times (1981, 1983, 1990, 1991, 1996). He also played in major tournaments such as New York Open, World Open, Chicago Open and North American Open and reached a peak rating 2439 in 1988. For decades, he was one of the strongest African-American players in the country. The youngest of four Carlin boys, he was preceded in death by Blanchard and survived by Eddie and David. Carlin once graced the most active list playing 200-250 games a year, hitting his stride in the 80s. His last tournament was the 2014 Texas State Championship and he ended at his rating floor of 2200. In his heyday he scored a number of scalps. Here is one of his wins against GM Larry Christiansen. Notes are by Carlin. Carlin’s victory over Christiansen had a poignant sidelight. Although the organizers provided clocks for use on the top boards, Carlin insisted on using his own. Naturally, a tournament director asked why he was being so stubborn. Carlin replied that the clock in question had been given to him by a lower-rated friend who had subsequently died. He wanted to honor this friend by using this clock while playing a world-class opponent. Carlin was permitted to use his own clock, and the Louisianan showed his gratitude in striking fashion. Before leaving New Orleans he ran The Chess Academy in New Orleans and championed what was called “The Carlin Method” which is first of all, TO HAVE FUN!! Here are a few more of his exciting games including one with the irrepressible Emory Tate. Very sad news. Alfred was my chess big brother back in the early 70’s. His uncle and my dad worked together, so he always looked out for me. Back then, there weren’t the large numbers of kids playing in non-scholastic tournaments like there are today. He helped me learn a lot about the game, and also about how to be a person of integrity. He was a fierce competitor, with an approachable personality that brightened everyone who encountered him. As far as I know, he was pretty much self taught. No internet back then, nor easily accessible GM level teachers. I’m sure he is up above, teaching them the “Got-gambit”! You are missed, my friend. I played in a small tournament with Carlin c. 1992. The topic of Tate cam up. It was obvious that Carlin was in awe of him. Just talked to Herminio Baez this evening. He shared very deep insight in Al’s life. He mentioned that Big Al was teaching chess in New Orleans, but was uncharging for his services ($20/hr). Herminio encouraged him to charge at a competitive rate given his master-level strength. He also mentioned that Al told him of verbal abuse in New Orleans due to his obesity. However, in Dallas, he got a new lease on life and was well-liked in the chess community. Toward the end of his life, Al had developed a number of conditions and had gain additional weight. The effects of congestive heart failure had become acute only a week prior to being admitted to the hospital. He is survived by two brothers, Eddie and David. Hello, I am Karen Johnson, also a friend to Alfred. Do you know where he his final resting place is and is his brother, Eddie, still in the Dallas/Richardson area? Please call me at 972-369-3211 to let me know. From what I understand Eddie is still in the Dallas area. That is only on the account of Alfred’s friend Herminio Baez. I believe the family has decided to make arrangements, but not sure of the details. Herminio told me they were planning a memorial in Dallas. I was one of Al’s students in the early eighties. Jude Acers introduced me to him. I studied under Jude and then Alfred. We were friends. I walked away from chess towards the end of the eighties and went to college. I never saw him again. I too am late with this response. Thanks Daaim for an excellent piece on Alfred. He was my brother, mentor, coach, icon, and friend. I loved Alfred and the clock belonged to a mutual friend Hermon Broussard another African American master from New Orleans. Alfred taught me how to energize my teaching chess to youth. Words can never express my thanks for your empathy in reaching out to both Alfred and myself. I had retired from chess and you, the Chess Drum, and Alfred revived me after Hurricane Katrina. I will miss Big Al, but confidently concur with his thanks and appreciation for what you and the Drum did for us both! Thanks Dr. Daaim. Alfred was teaching my twin boys since couple of years. My kids excelled in chess because of his excellent teaching skills. One of my boys ended up winning a tournament in Dallas. We will all miss Alfred. May his soul Rest In Peace. Somehow I just found out about this by landing on his chessgames.com page… Such sad news. I’m from the area and was a student of Alfreds in the early 90s. 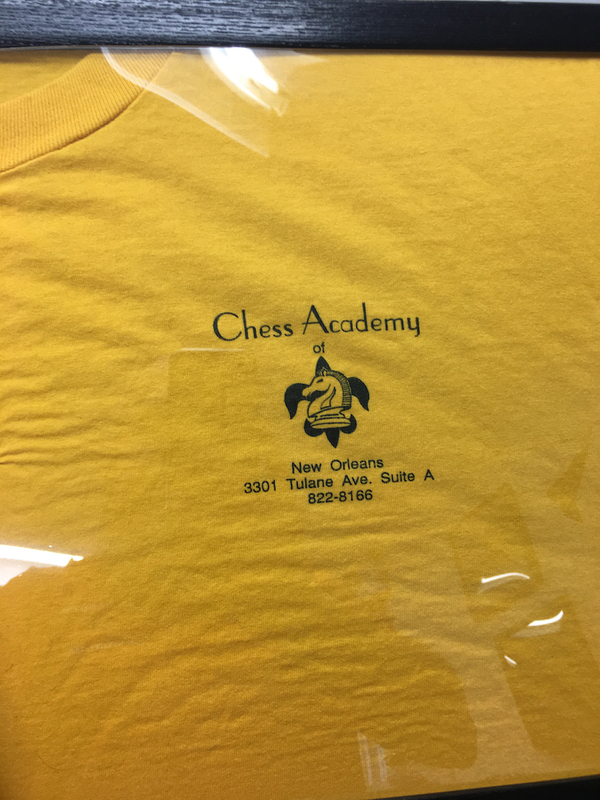 From Jude Acers/ New Orleans Chess competition versus Mr. Alfred Carlin and myself was savage…with no quarter asked or given. I played 15 chess matches in Louisiana 1962-2000 with local master rated players..Mr. Carlin was the only one who got to round 5 still alive with chances to at least draw…and serious health personal problems kept him from going much further.His win versus Grandmaster Christiansen deeply moved/thrilled the chess community here..You neglected to mention that hundreds of people died within blocks of Carlin / it was that close ..he heard the initial screams in the distance …Also it should be noted that he and the late Bernard Parun (not to be confused with a legendary player Bernard Parham) were the most active Louisiana chess players of all time ..the chess shadows.. played everywhere and everyone in Louisiana and it is no exaggeration to say Alfred Carlin played hundreds of thousands of clocked speed games .bar.’club offhand games versus seamen/tourists/ locals in his own off the highway chess club. I phoned his home only once.. His mother instantly answered “Hi Jude..I just put him on a bus to another chess tournament” . Always. Chess was good for him. Strangely I think of him every single time I hear a multimillion selling road monster hit that followed me around in vagabond summer 1968 with William Bills/Browne/Burkett/Frizinger the poet . and John Hall…”Angel of the Morning” by Merrillee Rush and the Turnabouts. it fits him…I had all the breaks /fantastic fabulous fortune in playing a two game match with Fischer and two matches with Grandmaster Walter Browne / The Fischer boom /fabulous health/ incredible management /1000 mall. prison,.media and school appearances in 46 states/ 20 nations… with promo genius Russell Miller of Yakima Washington who totally booked all this plus monster Guinness book of world exhibitions for me twice..I was simply at the right place at the right time in world chess history. Fortune… he had none really. He affected everyone who knew him. Jack London was right ” be a burning comet… “I INTEND TO USE MY TIME, ” Carlin certainly did. and…Yes I played with Herman Broussard’s clock which winged through tragedy to the staggering Carlin-Christiansen encounter. I still remember Broussard on the second floor of New Orleans public library ” HI Jude..I am studying for tournament in Lafayette this weekend” He died one hundred yards away in a hospital awaiting a defective heart operation.. yes it is true .deeding that humdinger clock to Carlin …the story hitting the daily newspaper/ his friends like a bomb. Jude Acers/ New Orleans PS please allow me to mention another name in Mr. Alfred Carln Louisiana orbit all through the years… world fide rated elo 2350 world rapid rating lists… retired contractor Mr. Charles Galloway of Baton Rouge who died just weeks before Mr. Carlin ..returning home after living in Russia. winning a small Russian city club championship ……. gallivanting all over the place …. like the wind. Like Carlin. Thanks for those wonderful insights! There is no way that anyone except a local would be able to contribute so many details. I had a couple of conversations with Alfred about Hurricane Katrina. Of course that was so long ago and I did not recall the details of his story. I’m not sure he mentioned to me hearing people in trouble. That’s fascinating. I just remember him saying he woke up in the middle of the night and got out just in time. I remember him being very surprised that I had tracked him down.